059. FRAM. 1893. Issued by Issued by R. & J. Hill Ltd. (1940). Card number 14 from a set of 50 entitled "Famous Ships". Size: Ca. 2.5" x 1.5". 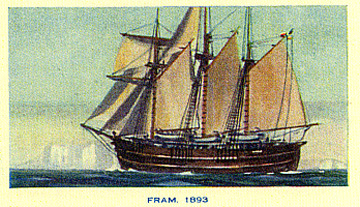 Recto: View of the Fram under full sail. Verso: FAMOUS SHIPS | No. 14. | THE "FRAM." | The Fram was built in 1892 for Nansen's Arctic Expedition, and the gallant Iittle three-masted schooner stood up nobly to her task. Note: Image and information courtesy of Evan Jones, Wiltshire, England.